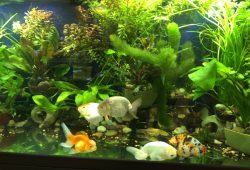 The article gives a detailed analysis of Growing Live Aquarium Plants. Aquarium plants add beauty to a tropical fish tank and provide excellent hiding and rearing places for fish. Fish tank plants are essential aquarium accessories. 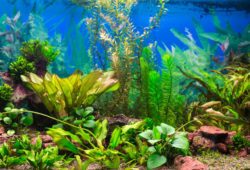 Whether they are gracing the tank of a new fish tank hobbyist or the aquarium of a seasoned tropical fish keeper, aquatic plants play an important role in the home aquarium. Tropical fish need places to hide and feed, and aquarium plants help them do this. Plants are also a beautiful part of any aquarium design. Fish in tanks with abundant vegetation tend to be healthier and have brighter colors. Through photosynthesis, plants create oxygen and fish breathe this in through their gills. Fish also love aquatic plants because they provide places to hide and breed. Some fish eat plants. In a natural environment, there are plenty of plants to go around. In a tropical fish tank, putting live plants in a tank with plant-eating fish is an exercise in frustration. Silver Dollars love eating plants. Oscars and many goldfish will knock plants from their moorings. Choose fish and plants that work together. Aquatic plants for the home aquarium can be found at stores that sell fish tank supplies and accessories. Choose different plants for different parts of the tank design. The back can have taller plants, while the front can have small bunches. Choose one or two striking plants purchased for their color or leaf shape. Plants can also float on the surface, but be wary: floating plants require a lot of light and tend to take over the water surface. All plants have species-specific needs for light, soil nutrients, and pH. Aquarium plants are no exception. For plants to grow and thrive, they need adequate light. Like house plants, tropical aquarium species have different light requirements. Choose a filter that clears out plant particles so that the water remains clear. Cloudy water contains sediment that can fall on plant leaves, making it more difficult for plants to photosynthesize. The rooting and water environments are also important. Tropical aquarium plants do well in fine gravel and prefer to have a small amount of iron fertilizer in the water, if possible. Use very small amounts of fertilizer to avoid polluting the tank. It is also possible to purchase a clay substrate for aquatic plants. 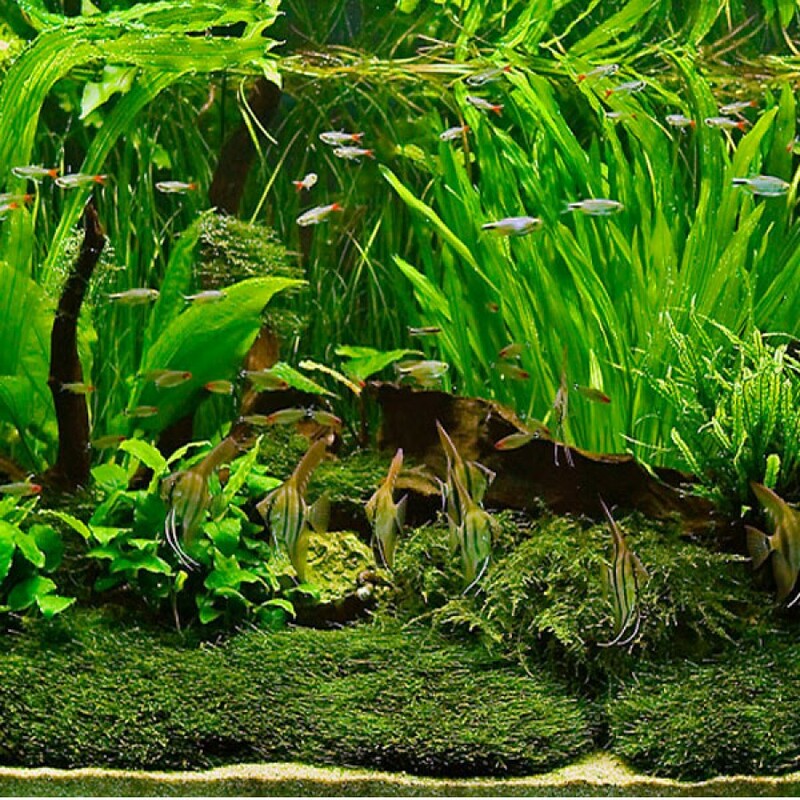 Most aquatic plants prefer an aquarium pH between 6.5 and 7.2, though individual plants vary. Some aquarium plants are easier to manage than others. Try out different plants in the tank to see what works for the particular light and pH levels that tend to dominate the particular environment in that tank. Plastic and even silk aquarium plants are beautiful artificial plant alternatives and can closely resemble the original plants. Purchase sturdy artificial aquarium plants that do not easily pop off their moorings, or the aquarium will soon be full of floating pieces of plastic. These plastic plants provide great hiding places for fish. Aquatic plants are a beautiful and essential addition to a freshwater tropical fish tank. They provide visual interest, add oxygen to the water, and create hiding and breeding places for fish. 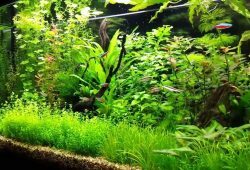 Caring for indoor aquatic plants is an art well worth pursuing, since these plants add a new dimension to a water garden or fish tank hobby.